We live in a world where apps have become a way of life. A day without Google Maps, Facebook or UBER may bring out a sense of barrenness in most of us today. This makes the ‘war of the apps’ an interesting space to watch. We can’t do without them, and that’s the precise reason that developers need to have a robust strategy to keep their users enticed. A single slip may lead to a deleted app or adverse publicity. App marketers who have just started out do not possess adept knowledge of mobile app marketing techniques-the process, the challenges and a complete know how of this burgeoning craft. Having spoken to numerous app developers, we’ve realized that there’s a huge gap here that needs immediate attention. That’s when we decided to speak with a few industry stalwarts through our brand new series #AVExpertTalk. This series is aimed at exploring mobile app marketing from close corners, where we discuss anything and everything that will make your apps shine brighter! We begin this series with none other than Rahul Varshneya, co-founder of Arkenea LLC and the author of the much-acclaimed book – Appreneurship: Build A Mobile App Business With No Technical Background. Rahul is a known name in the app marketing circles and has a firm grasp of this topic. Apart from this, Rahul is a prolific writer whose insights on app marketing can be read in major publications such as TNW, Huffington Post, and Entrepreneur Magazine. 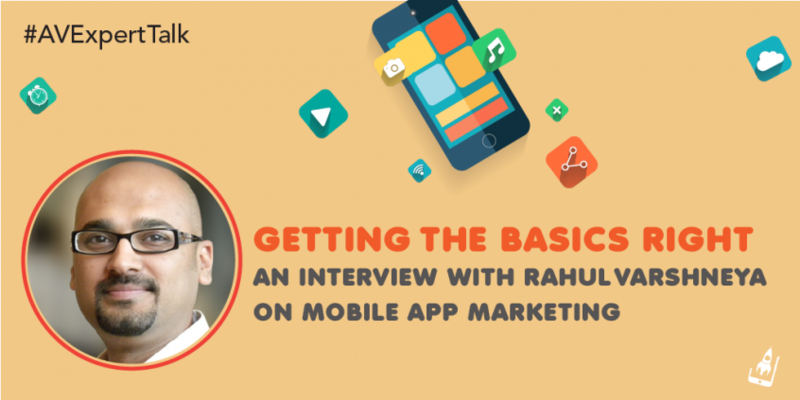 In this E-Interview, I spoke with Rahul on the challenges faced by app developers. He has also shared a few handy tips for developers and a bit on what works in the business. In your experience, what are the common hurdles faced by app marketers? Identifying the growth channel(s) would be the most common hurdle faced by app marketers. Also, this is the most challenging bit to arrive at, when in the early stages of the app live in the app store. Typically, any product will have that one channel that works for them, in terms of traction or engagement put together. App marketing arena is fast paced, what do you think is that one element that is often overlooked by app developers? App developers often overlook the basics and fundamentals of marketing and get lost in the marketing channels such as social media, etc. Fundamentally, understanding who your customer segment is and where they hang out, is key to good marketing – whatever be the channel or medium to reach out to them. If you look at any successful app today, all of them have grown on the back of one channel. There are many great examples, such as Slack, Snapchat, Instagram to name a few. There’s nothing called the BIG launch. Almost every successful app started by catering to a small niche or customer segment. Once they achieved product/market fit, they then worked towards scaling the market, keeping in mind the customer development cycle. Focus more on product/market fit initially, even if that means you have only a 100 or 1,000 relevant users. Focus on engagement – anything less than 40% of overall relevant users or target segment (at a general level) should raise a red flag. Your two cents of advice on working on feedback from app users. What’s not to be missed here? When working on feedback from app users, don’t take it literally when they request for new features. Try and understand the reasons for requesting new features and use your insights and knowledge to build a more apt solution that would cater to the broader segment. What’s your take on App only businesses? Should they have a desktop presence as well? Highly debatable, but it also depends on the nature of the business. If your product naturally lends itself to mobility or use on the go, you don’t necessarily need to have a desktop version. For example, Shazam doesn’t need to have a desktop version for the music discovery piece (which is their core), but now has a website that allows one to use the social features or following people. Study the behavior of your customers and assess how a desktop version can add value to them. If it doesn’t, don’t build on day one. You’ve mentioned the benefits of word-of-mouth in a previous article. How can app developers leverage this basic bit? By building a base of passionate users. Passionate users of your product – typically those that can’t live without it, now that they’ve used it, are most likely to recommend your app to their network. Ensure you identify that segment and also make sure they have a fantastic experience using the app. Secondly, build viral loops (if your product is of a viral nature) to enable users to spread the word through the application. Which brands, according to you have used In-app referral to the fullest? Dropbox, Runkeeper, Candy Crush Saga and Snapchat come to mind who’ve implemented fantastic viral loops to acquire more users. Identify your customer segment, serve their needs well to get to product/market fit and then think about scaling. Lastly, we would love a peek into your ‘app marketing stack’. Books, tools and people to watch out! Some of the people that you must follow for marketing advice and strategies are Brian Balfour, Morgan Brown, Brian Dean, Rand Fishkin, Hiten Shah and Neil Patel. We sincerely hope that this interview would help you in fixing the leaks in your app marketing strategy. If you are looking for more dope from Rahul, sign-up for his awesome course here. You can also connect with him on Twitter. We would love your recommendations for making #AVExpertTalk a hit! Do drop us your suggestions in the comments section below!